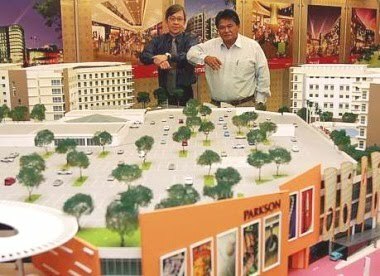 Calvin Low (left) and Datuk Mustapha Buang viewing the model of KK Times Square 2. The project is set to be launched next month. Asian Pac Holdings Bhd is building up its property investment portfolio in new growth areas to widen its income streams. According to managing director Datuk Mustapha Buang, the company will consider land that is ready for development in the Klang Valley, Penang and Johor. “By raising our property investment portfolio, we expect to raise our annual income from investment property of about RM1.5mil now to more than RM40mil in the next three to four years. The existing income is mainly derived from car parking fees,” Mustapha says. Currently, Asian Pac operates 1,300 car park bays in Kota Kinabalu and another 2,300 bays will be ready in the next three to four years. It also has a 6.3 acre site in Kepong Entrepreneurs’ Park that is being leased to Carrefour. Mustapha points out that most of Asian Pac’s projects are in Kuala Lumpur now and the company has experienced some delay in the approval application process pending the Kuala Lumpur City Draft Plan 2020. “It is also getting more challenging as land cost in the city has appreciated by 20% to 30%. Building up another source of regular income flow will ensure we are able to diversify our income streams,” he adds. Currently 40% of Asian Pac’s sales come from commercial projects and the balance from residential projects. For the financial year ended March 31, 2010 (FY10), the company recorded sales of RM101.6mil against RM83mil in FY09. The company has in the pipeline four mixed developments with a total gross development value (GDV) of more than RM1.8bil for launch in one to two years. The first will be KK Times Square phase two in Kota Kinabalu; Dataran Wangsa in Wangsa Melawati, Kuala Lumpur; Kepong Entrepreneurs’ Park parcel B4 in Kepong and Dataran Larkin in Johor Baru. A residential project for launch early next year will be Bijan at Country Heights comprising 12 terraced bungalows and semi-detached houses with GDV of RM20mil. KK Times Square 2 will be launched next month, Dataran Larkin by November, Dataran Wangsa by December and the Kepong Entrepreneurs’ Park project will be early next year. Its wholly owned unit, Syarikat Kapasi Sdn Bhd has built up a good track record in Kota Kinabalu through its KK Times Square 1 comprising 5-, 6- and 8-storey shop offices and Karamunsing Capital’s 55 units of two- and three-storey shops. “We want to leverage on this presence and are on the look out for strategic land for development in Kota Kinabalu. We are also exploring possible joint ventures with Government-linked companies. “With climbing palm oil prices, the Sabah Development Corridor and increasing tourist arrivals, we see good potential for Kota Kinabalu’s property market,” he adds. Syarikat Kapasi, which owns the 23.45 acres that KK Times Square is located on, was acquired in 1997. The land is strategically located at the coastal area of Kota Kinabalu, close to Sutera Harbour. Located about 10 minutes from the airport, KK Times Square comprises shop offices, a shopping mall of about 670,000 sq ft in net lettable area, 41 exterior shops and 498 serviced apartments. Asian Pac chief operating officer Calvin Low says the project with a total GDV of close to RM1.4bil, is slated for completion in 2013. “The 670,000 sq ft of net lettable area to be completed in the later part of 2013 will be able to churn out rental income of RM40mil a year. The five blocks of serviced apartments and shoplots with a GDV of RM460mil are for sale,” Low adds. To raise funds for the KK Times Square 2 project, Sykt Kapasi would issue RM200mil nominal value of up to 5-year guaranteed commercial papers or medium-term notes to be guaranteed by Danajamin Nasional Bhd. Danajamin is guaranteeing the bonds based on the viability of the project as the fund will be raised specifically to finance the project. Mustapha says Danajamin’s guarantee has provided the company the opportunity to raise longer term borrowings at a reasonable cost within a shorter time. He says this form of fund raising would be popular, especially in projects where there are no sales during the construction period. “Despite being a mid-sized developer, we are now able to raise bonds for project financing. “Bonds wrapped by Danajamin will automatically be upgraded to AAA rating, which gives investors an assurance of the quality of the paper,” Mustapha adds. BRISTEEL Properties Sdn Bhd plans to buy up to 16 hectares of land at the Palm Oil Industrial Cluster (POIC) in Lahad Datu to develop industrial shoplots intended for small and medium enterprises (SME). "We believe that over the next 10 years, POIC in Lahad Datu would have grown into a major integrated industrial complex anchored by oil palm-related downstream industries," said company spokesman William Chee. The company yesterday signed a deal to buy an initial four hectares. The Bristeel Group, which owns the patented BriSteel Roof Truss System, has been in business for more than 10 years. Bristeel Properties has an option to purchase another 12 hectares of adjoining land for future development in anticipation of rapid economic growth in Lahad Datu. 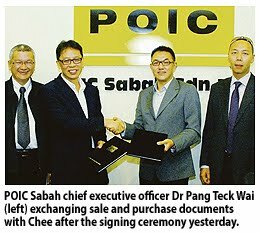 Starting in 2005 with an initial 460 ha area, POIC Lahad Datu is being developed by state-owned POIC Sabah Sdn Bhd. Some 25 companies have already bought land for a variety of palm oil-based and supporting industries in the area. A further 1,200 ha have been set aside for a new phase. "We are confident in the future of not only POIC Lahad Datu, but the greater Lahad Datu and its surrounding areas," Chee said. Its project, dubbed Port City@POIC, will provide premises of modern and functional designs for SMEs. The initial phase will offer 33 units of detached and semi-detached warehouse-type buildings. The local property market is abuzz with new launches once again with reports of good take-up for quite a number of recently launched residential projects especially those in well sought after locations. Things are looking up for the market, especially in the landed residential sector although the condominium market is still quite soft. The overall sentiment has certainly improved and developers are reporting much stronger sales compared with the last two years. In fact, residential property prices have appreciated quite substantially with prices even doubling in some areas. Property buyers are taking advantage of the prevailing low entry cost and cost of financing to “catch the rising tide”. Although interest rates have increased slightly, the hike is quite gradual and minimal, and have not impacted sales much. Mortgage loans easily make up close to 30% to 40% of the total loans disbursed and this shows the importance of the property market to the overall economy. Although the market has been quite resilient, it is important to ensure it will not be over-geared as too much borrowings could be a prelude to over-speculation and price bubbles. While more launches mean more choices for buyers, the question is whether the flurry of new project launches is good or bad for the market. This depends on various factors including the percentage of buyers who are buying for their own occupancy, the holding power of those who buy for investment, the strength of the local economy and market sentiment going forward. More buyers buying for their own occupancy is a good sign as it shows the market is fundamentally stable and well supported. This seems to be the case for the landed residential market so far. Those who purchase for investment but do not have the holding power may need to liquidate their positions to cut their losses in the event of a market correction. They are actually speculators and many of them usually resort to bank loans to finance their purchase. If the market gets too speculative, it is unhealthy as the risk of artificially driven prices and overheating will be higher. While things still seem to be going well, industry players should plan and build according to what the market actually needs and should not over-price their projects. Affordable housing projects that have good accessibility and infrastructure facilities are still in short supply. Meanwhile, the commercial property sector is still facing a glut and there should be better planning to space out the developments. While new project launches take care of the supply side of the equation, the demand side is also important and should be given due attention. One of the factors driving demand for a project is its accessibility. News that the Government is looking at a mass rapid transit (MRT) system to improve Kuala Lumpur’s public transportation network will give a boost to buying sentiment, especially for areas that will be serviced by the MRT. It should be accorded top priority as it is a project that will improve the people’s quality of life. Having a highly efficient and well integrated public transport system that is dependable upon will take the load off our heavily congested roads. There are many ways to raise the quality of life for Malaysians and one of the fast tracked ways is to put in place a world-class public transport system right where it is needed most. Much has been said about how disenchanted Malaysians are with the state of the existing public transport system as the various modes of transport and facilities are not integrated with nor complementary to each other. Hopefully the latest initiative will look into all the important areas and will be implemented holistically with other ancillary facilities and services to ensure the whole public transportation network is totally integrated and complements each other. Hopefully it will ply most of the heavily populated neighbourhoods and commercial centres not just in the city but also in other parts of the Klang Valley like Petaling Jaya and the suburbs. Besides the cost savings, it will also be a greener option and ensure a more oxygenated environment for city folks. ·Deputy news editor Angie Ng looks forward to leaving her car at home and enjoying the simple luxury of a cheap and safe mode of travelling around the Klang Valley in public transportation. LBI Capital Bhd, a small property developer, plans to launch three projects in Johor and the Klang Valley with a total gross development value (GDV) of RM210 million. LBI Capital, which diversified into property development in 2004, embarked on its first project in Ara Damansara. The company used to supply air-conditioners to Proton Holdings Bhd but exited the business due to stiff competition. "Property development now contributes more than 95 per cent to our earnings while the manufacturing of rubber mats and outer shoe soles make up the rest," said managing director Datuk Ng Chin Heng. "We expect to launch projects at the end of the year as consumer confidence picks up," he told reporters after the company's annual general meeting in Shah Alam, Selangor, yesterday. Also present were chairman Tan Sri Arshad Ayub and executive director Kong Sau Kian. LBI Capital is banking on three property projects with a total GDV of RM210 million - two in the Klang Valley and one in Tampoi, Johor - to drive profits for the group until 2012. The group plans to build 11 units of three-storey bungalows in Section 14, Petaling Jaya. The 0.85ha site is located opposite the Aman recreational park and near the Sri Aman secondary school. In Puchong, LBI Capital will step up sales of industrial lots on a 14.4ha site in Puchong, Selangor, a project with a potential GDV of up to RM90 million. The industrial area will cater for the needs of various industries especially those from the small- and medium-sized sector. "We see high demand for corporate office and warehousing in industrial lots due to the growing number of SMEs. Each lot measures 10,000 sq ft," he said. Over in Tampoi, Johor, LBI Capital is building 21 units of shop lots worth RM14 million. The shop lots are located along the Skudai Highway in Taman Mewah. On the outlook, Kong said the group will continue to look for opportunities to partner landowners in the Klang Valley to develop mid-to-high-end properties. CONSTRUCTION and property development group Putrajaya Perdana Bhd has won a RM142.8 million contract to build a 300-bed private hospital in Desa ParkCity, Kuala Lumpur. The project was awarded by Trekker Avenue Sdn Bhd, a subsidiary of Perdana ParkCity Sdn Bhd, to Putra Perdana Construction Sdn Bhd. The project, which will include a six-storey elevated car park, will be completed in April 2012. Perdana ParkCity is the developer of the 473-acre Desa ParkCity township. Property developer Mulpha International Bhd aims to list unit Manta Holdings Co Ltd on the main board of the Stock Exchange of Hong Kong (SEHK) by next month. Mulpha chief executive officer Chung Tze Hien said it expects to hear from the listing committee in Hong Kong in the next few days. "We still have to secure shareholders' approval. I'm waiting to hear from the listing committee in Hong Kong whether our proposed listing is successful within the coming two days. "I met up with them yesterday (Thursday), but they may need to ask more questions or requirements. If they had approved (the proposal), the listing would have been done by the middle of July. I'm waiting for some outcome," Chung told reporters after Mulpha's annual and extraordinary general meetings in Kuala Lumpur yesterday. In April, Mulpha applied to Stock Exchange of Hong Kong Ltd to list its subsidiaries involved in the sale, rental and servicing of construction equipment on the SEHK. Chung said the listing will enable Manta to raise money from the capital market to fund the group's business activities and expansion plans. "Being accorded listing status will allow the Manta group, which comprises four companies, to have greater financial flexibility in pursuing its growth plans." The listing of Manta will involve Manta Engineering and Equipment Co Ltd, Manta Equipment Rental Co Ltd, Manta Equipment Services Ltd and Manta Equipment (S) Pte Ltd. According to Chung, Mulpha owns 88 per cent of Manta. Pan Ocean International Ltd, which holds the remaining 12 per cent via Ku Sze King, will sell its stake to Mulpha prior to the listing. As part of the listing exercise, Mulpha will undertake internal restructuring and reorganisation, after which it will issue 50 million new Manta shares representing 25 per cent of the enlarged issued and paid-up capital of the company. The new shares will comprise five million issue shares available to the public in Hong Kong and 45 million shares by way of placement to professional, institutional and other investors. None of the directors in Mulpha and Manta will be offered shares in Manta pursuant to the proposed listing. "We hope to raise about HK$50 million, or about RM25 million, from the proposed public issue," Chung said. He added that the proceeds will be used to buy tower cranes and construction equipment for rental purpose, general working capital, expansion and improvement of storge facilities, service and maintenance workshops. "Singapore is booming. Market price in Singapore is shooting up. So is the situation in Hong Kong and China. Construction of high-rise buildings needs a lot of cranes. This augurs well for our business." Chung expressed confidence that Mulpha's financial performance will improve further this year in tandem with economic recovery here and in countries where it operates. "Last year was a bad year. We are now going out of the 2008 and 2009 crisis. Last year also, we had impairment, but not this year. As we move on, things will be better. In fact, our first quarter results look pretty good. We are on the road to recovery," he said, adding that Mulpha registered a net profit of RM48 million in the first quarter ended March 31 2010.